Post eruption, the most colorful show at Hawaii Volcanoes National Park is at sunset. A class of students perch on a rise overlooking Kilauea volcano, preteens in T-shirts and baseball caps gathered at the Keanakako’i crater viewpoint in the center of Hawaii Volcanoes National Park. Their task for the morning is to draw the landscape in black and white and write haiku poems about what’s before them: a gaping hole in the crust of the planet. They’re students from the Volcano School of Arts and Sciences in the nearby town called, yes, Volcano, on the 50th state’s biggest island. Their teacher is effusive, her arms thrown out wide as she describes the rockfalls, the jagged edges; the kids are less enthusiastic. For them, this is homework; for the adults, a reunion with an old friend. The island of Hawaii—what most of us call “the Big Island”—is more low-key than her neighbors, a favorite destination for Pacific Northwesterners who eschew wall-to-wall resorts. 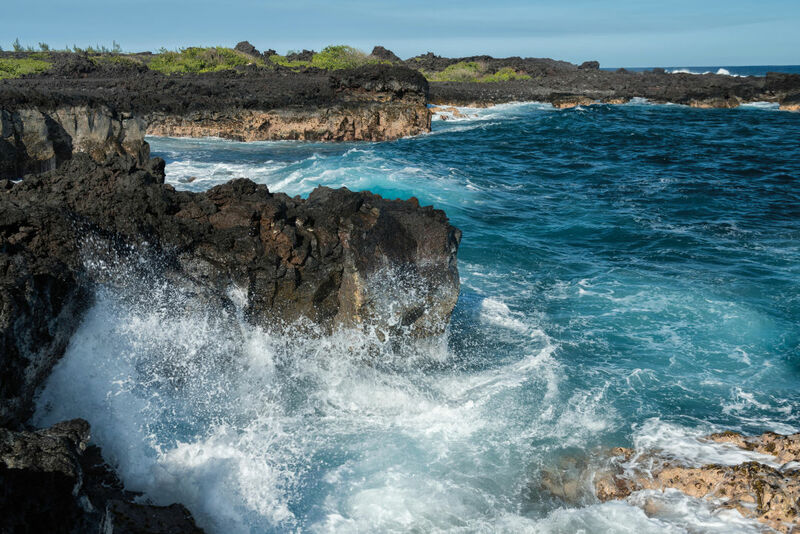 More than 100,000 Washingtonians come here every year to snorkel in the sparkling waters at Kealakekua Bay, to see where their beloved Kona coffee is grown, and to spend lazy hours on the soft white sands of the Kohala Coast. 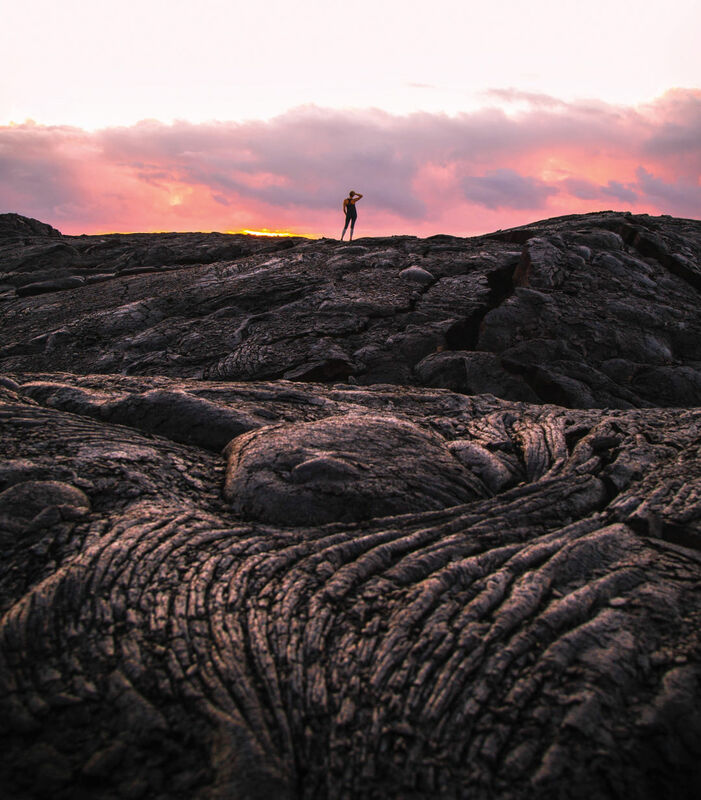 But in 2018, life on the island centered around Kilauea’s eruptions, a geologic event like none in living memory. The serious activity started in May, becoming so intense it was no longer safe to visit the park. Hot lava spilled out of cracks in the ground, the earth trembled and shook, and towering columns of sulfurous gas shot hundreds of feet into the air, leaving parts of the island obscured by a thick, unhealthy vog (a combination of fog and volcano gases). The red and orange sprays of lava made for a spectacular show, but more than 700 homes were destroyed. Tourism, a major driver of the island’s economy, took a massive hit. Hawaii Volcanoes closed completely for 134 days—but now that the mountain sleeps the national park has been reborn. 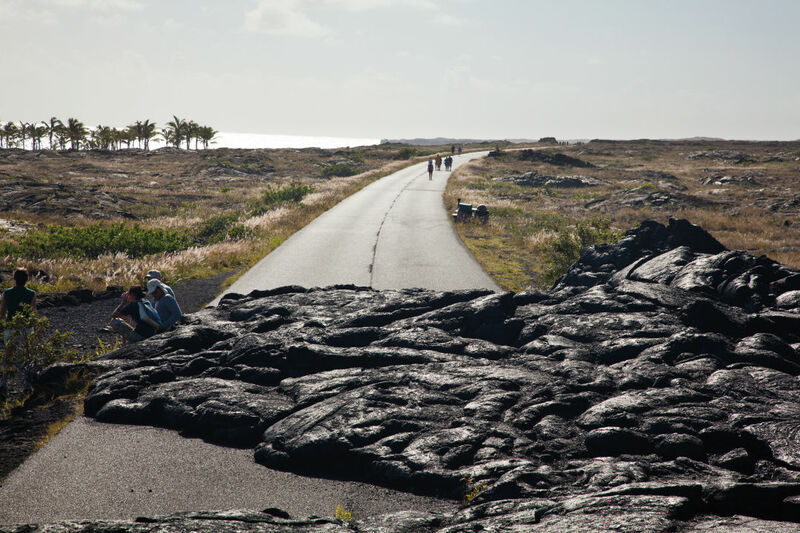 The lava flow across a park road. Things are gradually returning to normal—or what passes for normal on an active volcano in one of the most remote places in the world. Regular lava flows were common before this year’s dramatic eruptions—a steady trickle compared to the 2018 full rock show—but now, for the first time in 35 years, there is no active lava at the park. The air is clear over its 520 square miles, over its other active volcano, Mauna Loa, over its 59 endangered species. Much of the plant life growing here is found only here, and it gets more than two million visitors every year. While Kilauea’s vents are still steaming, the air is clear from the Keanakako’i viewpoint on Crater Rim Drive and you can discern the double yellow stripe of roadway that collapsed from the other side of the crater, about three miles away. Head southwest on Chain of Craters Road and you see so far across the deep blue Pacific that the water seems to curve, just slightly, at the edge of your vision. Last summer, the view was sulfuric vog. Scenic Crater Rim Drive is closed to cars but open to hikers bound for the overlook; the whole park is a patchwork of open and closed attractions. The visitor’s center and the excellent art center are accessible; Volcano House Hotel reopened in October after repairs. The park’s Jaggar Museum was due for an extensive remodel anyway and may require a new facility so its doors remain shut. Closed too are some trails and the popular Thurston Lava Tube, until the U.S. Geological Survey and park officials identify where the ground is stable. The view from Chain of Craters Road. Hawaii Island makes up nearly half of the state’s size, and its eight distinct ecosystems—the park alone has seven of them—mean it offers overwhelming diversity. It’s a short drive from bright green ferns to the sprawling lava fields where this corner of Polynesia remakes itself in real time. It’s a little further to where the island still spills into the sea, a flying buttress of hardened lava holding the sharp black coast in place while the blue Pacific booms against the cliffs. Human history runs deep at this park, inseparable from the fissures and fumaroles. 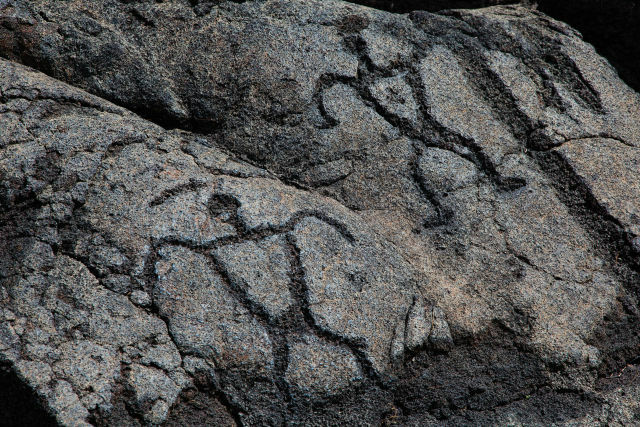 The petroglyphs at Pu’u Loa speak of people marking their names, their stories, for at least 1,000 years. Elsewhere in the park, a grove of palm trees marks the place where the ancient village of Panau used to stand. Respect for Pele, the fire and volcano goddess who makes Kilauea her home, is alive today: Locals place ti leaves, flowers, and spare change at the edge of the crater in acknowledgement of Pele’s power and her ability to change the shape of the island as she sees fit. When locals give directions, they almost always include a reference to where something used to be: “Turn inland where the gas station was, you know?” Standing on the edge of the crater, looking at where the road used to be, the habit makes sense. The island changes—and just because something is there today does not mean it will still be there tomorrow.